CorDEX Instruments, the manufacturer of explosion proof equipment, is today launching the LaserMETER3000XP, a dynamic, custom-designed distance measurement tool, suited for offshore workers. The handheld tool with its robust IP65 flameproof design is both ATEX and IEC/Ex Zone 1 IIC T4 hazardous (explosive) area certified, making it suitable for offshore personnel working on high risk rigs and installations, who currently have to obtain special ‘hot work permits’ to use standard electronic measuring devices. Encased in tough aluminium, it can withstand harsh environments, accidental falls or knocks. 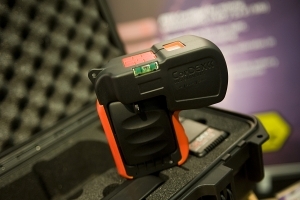 The LaserMETER 3000XP is also easy to use with simple operating functions to cater for workers in hazardous locations wearing protective kit and gloves – offering speedy and accurate distance, volume and area measurement within explosive areas. General Manager Marcus Halliday believes the LaserMETER 3000XP is an essential piece of kit for offshore workers which his team have developed from end-user feedback. He added: “Safety in the workplace is a major concern for companies and staff especially in places that are classified as high risk where it is crucial to eliminate the source of ignition which can come from electrical devices. The LaserMETER3000XP distance meter can be used within a Zone 1 IIC T4 hazardous (explosive) area. The IP65 design incorporates shock resistant, anti-static over mould with interchangeable battery pack and backlit LCD display .It is capable of measuring distances of up to 30m with an accuracy of 3mm. It comes packed with features such as Pythagoras and area and volume calculations.